Contest #7 in our Holiday Wishlist Extravaganza is here! The gift of art is something we often think to give to adults, but it isn’t usually something we think of giving to a bay. 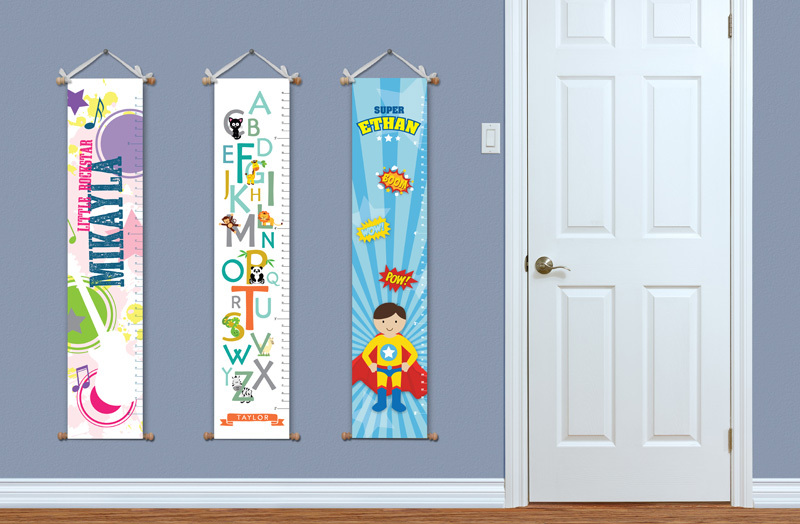 But an adorable, personalized growth chart is a thoughtful and fun present. Impressions Designs has a vareity of designs you can choose from and all of them are sure to give any child’s room a warm and subtlety vintage feel. Capture your child’s growth while adding a beautiful piece of art to adorn the walls of their bedroom. Not only will they have fun recording their growth as they get taller, but they will then have a personal keepsake to cherish forever. All growth charts are available as either removable vinyl stickers (decals) or printed on high-quality, flexible banner material adorned with decorative dowels on the top and bottom and ribbon for hanging. Want to see more of Impression Designs amazing wall art? Check out their website! Contest closes on December 14th, please read the Rules and Regulations before entering. My granddaughter is 19 months old and these would be perfect in her room. These are great to have!! This would be great for my wee nieces. Another great contest. These are super cute! This would be great for my granddaughter – thanks !